There is a new statusbar scroller showing Who is Online. This updates with Ajax, so it is not neccessary to Refresh your browser to see the list update. Those of you with Firefox will need to switch an option to see it. Checkmark "Change status bar text"
Also, please be mindful of the forum you post in. 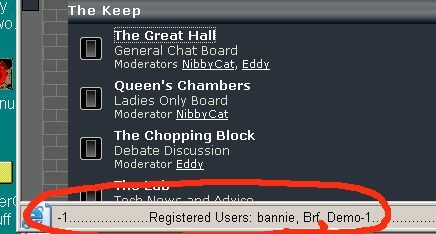 Each forum has a specific purpose other than this one. That's why the topic was moved. I see bannie's online when he isn't. I don't. maybe your browser is keeping the information static? Well... "online" doesnt really mean too much. There is no way of knowing when someone is just sitting there reading. All we can do is record the "last click". The online list at the bottom of the index, and the viewonline page show activity in the last 5-minutes. The scroller shows activity in the last 10-minutes. The moving lines bugs us. Can it be made to move slower? Can it be made to move slower? If I slow it down, it will move jerky. It is scrolling by deleting one letter at a time from the beginning. With a proportional font, the letters are all different widths. With slower scrolling, you can see that the little movements are not all the same size. yeah, it goes faster over the letters than over the "......................"
I was looking to see who was online, and I realized the scroll thing wasn't scrolling. It was annoying me, so I turned it off. Besides that, it was breaking the Location part of Who is Online.